And he still may win MVP. In an age of fly-ball hitters, Christian Yelich has remained grounded. Seated at his locker in the visitors’ clubhouse in Cleveland back in June, Christian Yelich looked more like someone you might find at a skatepark than an All-Star firmly in the National League MVP discussion. Yelich wore a straight-brimmed hat, jeans and a T-shirt that cloaked his lanky, 6-foot-3 frame, which sprawled out from a swivel chair before his locker space. Yelich has always posted excellent batting averages and on-base marks, but his home run totals during his first five years in the majors with the Miami Marlins were modest: four, nine, seven, 21 and 18. When the Milwaukee Brewers acquired Yelich in a trade this offseason, they were adding a quality all-around player and hitter — his 121 OPS+1 over his first five seasons means he was 21 percent better than the league average — but one who was not yet an elite offensive force. That has changed this season: Yelich (157 OPS+) is no longer just a good hitter, but an elite one. Yelich has already set a career high in home runs (33), he leads National League hitters in wins above replacement (6.8), and he will exceed a .500 slugging mark for the first time (.583) as he has helped the Brewers near a playoff berth and boosted their pursuit of the Chicago Cubs in the NL Central. 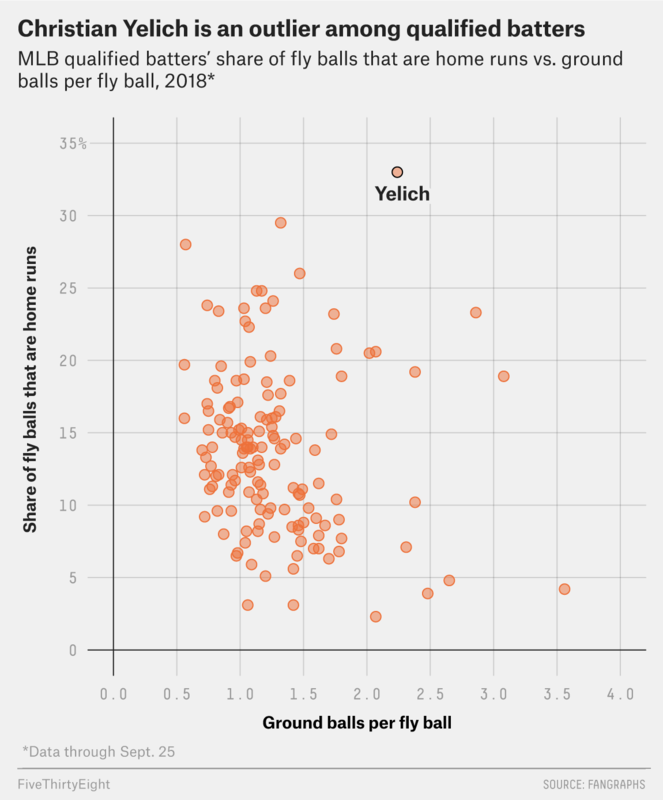 But what’s curious about his breakout is Yelich entered the year as one of the most prolific ground-ball hitters in baseball — just as the game is in the middle of a fly-ball revolution. What’s even more curious: He has remained that way during his breakout power season. While he’s launching homers at a career-best rate, he’s still divoting infield turf like few others in this age when hitters are trying to elevate balls in the air and terms such as launch angle have become common parlance in the game. In April 2015, 81.3 percent of balls Yelich put in play were grounders. He hit only two fly balls in the entire month. Since 2015, only five players have hit more ground balls than Yelich, and the Brewers outfielder ranks 14th in ground balls this season. So how has this career ground-ball hitter become a slugger overnight? For starters, Yelich is doing incredible damage on the balls he does lift into the air, rare as they may be. Among qualified hitters, he leads baseball in percentage of fly balls going for home runs (33.0 percent), ranking ahead of sluggers J.D. Martinez, Joey Gallo, Javier Baez and Mike Trout, who are all in the top seven. In the second half of the season, an astounding 44.9 percent of Yelich’s fly balls have gone for home runs. While those might be outlier rates, Yelich has posted a 19.8 HR/FB rate for his career, which is better than the major league average. What’s behind the surge? Part of it is a change of environment. From 2015-17, he had a better-than-average 20.4 percent HR/FB mark on the road compared with a middling 13.8 percent at home in spacious Marlins Park, the toughest venue to homer in this season. He’s now hitting mostly in Miller Park, one of the game’s most favorable parks for hitters. This season Yelich has a 38.8 percent HR/FB rate at home and a 27.5 percent HR/FB rate on the road. The park has helped, but there’s evidence Yelich might have also become a more powerful hitter. His average fly ball is traveling a best-in-baseball 358 feet, according to Statcast data. His fly balls averaged 321 feet last season, 346 feet in 2016 and 328 feet in 2015. Yet Yelich is still producing 2.24 ground balls for every fly ball — a ratio similar to last season’s (2.20) and not so far from his career mark (2.89). If Yelich had an MLB average fly-ball percentage (35.3 percent) this season instead of his 23.1 percent mark, and he kept his HR/FB rate in tact, he’d have hit 51 home runs based upon his first 437 balls in play. If he put half of his batted balls in the air — like Matt Carpenter and Gallo have — and maintained that HR/FB rate, he’d have 72 home runs. His HR/FB pace will be tough to sustain, but Yelich’s ground balls are no doubt draining some of his power potential. Or course, few around the Brewers are clamoring for Yelich to change anything. He might win an MVP award simply by using the same bat-to-ball skills that allowed him to rise to the majors after being selected 23rd in the 2010 draft. With his current approach, Yelich rarely hits a pop-up and sprays plenty of line drives. Still, the least valuable batted ball in baseball is the ground ball. Yelich has spoken about swing philosophy with one of the original, modern swing changers: Daniel Murphy, who in 2017 was a Team USA teammate in the World Baseball Classic. Yelich noted that, in Miami, home run king Barry Bonds was the club’s hitting coach for a season but never mentioned launch angle. But plenty of hitters have elevated their offensive efficiency and profile by purposefully lifting more balls in the air, from Justin Turner and Murphy, to more recent examples Jose Ramirez, Francisco Lindor and Carpenter. And Yelich has shown the ability to adjust. He has become more aggressive in swinging at first pitches throughout this season, and to great effect: Yelich is second in baseball to Martinez with a .514 batting average when he swings at the first offering, according to ESPN Stats and Information. And perhaps he has begun to make a slight adjustment, as his ground ball/fly ball ratio is 1.98 in the second half of the season compared with 2.49 in the first half. Yelich has proved he can make adjustments. So, what if he chooses to make a radical change? What if he suffers a HR/FB regression and needs to revamp his approach to sustain this level moving forward? What should be most concerning for the Brewers’ NL Central opponents is just that: Yelich could be even better. OPS+ considers a hitter’s overall ability but adjusts to account for ballpark and run-scoring environment. An OPS+ of 100 constitutes league average. OPS+ allows players across eras to be compared.